Wingin’ator 3000 is the name I’ve given to my modification to the Char-Broil The Big Easy TRU-Infrared Oil-less Turkey Fryer. I love using my Big Easy for whole chickens and turkeys, but when it comes to using it for chicken wings, it needs a little help. There’s just no real good way to load the fryer up with a lot of wings at once. So, I made the Wingin’ator 3000. All you need is the standard basket that comes with the Big Easy and some round (large square ones also work) disposable grill toppers. I used something similar to these 13″ ones, available from The Barbecue Store. You may also luck out and find them in your local grocery store. They are made by OscarWare. I also found these Oscarware 3-Pack Disposable Grill Toppers which are large enough that they should also work, along with these from Char-Broil. I turned the basket upside down and traced the outline of the circle it makes onto the toppers. I then cut the grill toppers slightly larger (by 1/8″-1/4″ than the circle using tin snips (wire cutters will work too). The metal in the topper is pretty thin so it cuts easily. I then gently folded each circle like a hard taco so I could slide it into the Big Easy basket from the side. I unfolded it and then crimped down the edges to firmly attach the toppers to the basket frame. You want to make sure that the toppers are relatively taut so they don’t fold in the middle under the weight of the chicken. Also make sure you fold the edges in pretty well or you might drag your knuckles on them! I added 3 toppers, creating 3 shelves for wings, 4 if you count the bottom of the Big Easy basket. If you’re looking for a way of making fried-like wings on the Big Easy, check out my recent post on crispy chicken wings. Oh and it’s all dishwasher safe making cleanup a breeze! Click here for some of the other awesome things I’ve made on my Big Easy. If you have any questions about the Wingin’ator 3000 drop me a note. Just hop on over to the About/Contact Us page. I look forward to hearing from you. 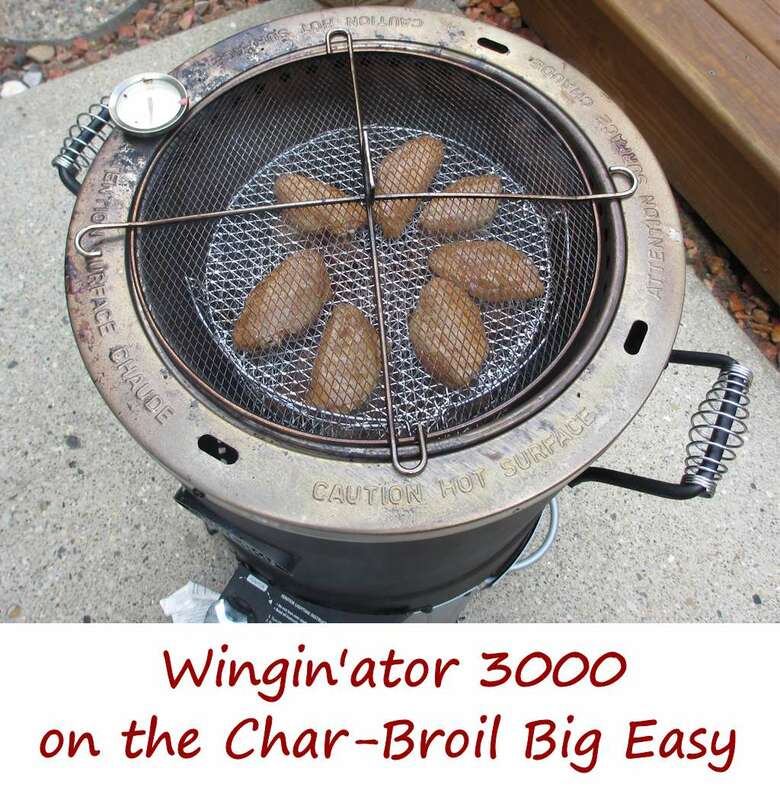 This entry was posted in From the Char-Broil The Big Easy™, From the Grill & Smoker and tagged big easy, big easy basket, big easy wingin'ator, wingin'ator 3000, Wingin'ator 3000 on the Char-Broil Big Easy by Mike. Bookmark the permalink. Have you considered selling these on Etsy? I’d buy them! Hi Shannon. I had a company lined up to make them but they (sadly) disappeared on me. I’m considering taking up the effort again here in 2017 if I can find a local supplier. Great set up…would love to have one! Also, have you ever cooked a brisket onyour big easy? Want to try it, but not sure if ishould lower the heat to cook it slower, or leave it onhigh n cook it by temperature. Hi! I have not yet done a brisket, but I see no reason you couldn’t. Though I’d usually go low-and-slow for a cut like brisket, you don’t have to. I think following a process like the one at the Virtual Weber Bullet below might pay off. I’d make sure to use a rub with smoked salt and/or smoked paprika in it to give it a bit of a smoke flavor. If you try it let us know! Am cooking the brisket on Saturday. I’m definitely looking forward to your results. Well Mike, made my 4lb brisket in the big easy saturday. It was very good! I cooked it to 165degrees, on high, then wraped in foil n cooked another hour. It was tender and flavorful, (rubbed with seasonings 2days ahead). Next time i will cut in half and use the bunk basket to cook the 2 roasts instead of hanging one. All in all was agood experience, especially taking only 3hours to cook, versus all day in the smoker. Will update when i cook the brisket in the baskets. That’s awesome! I am definitely going to try that too. Thank you for coming back to let me (us) know how it came out and what you did. I just cooked a brisket for xmas this year and it turned out great. We cooked about 15 lbs of brisket i had to cut it in 3 pices and used two bunks to put it all in the big easy. we started it at about 6:47 and the first one came out about 11:00 and the second one came out about 11:45 the third one took a little longer but it was all moist and tender. we loved it alot. this was the first time we cooke da brisket. oOnly the second time we used the big easy. I really love this cooker. That’s awesome Kendal! I have to admit, I have not tackled a brisket yet but after hearing about your success it’s definitely on my to-do list. What internal temperature did you get to? When I smoke brisket I try to get to 200 F, or just a few degrees over. I love the Big Easy too. Great cooker!